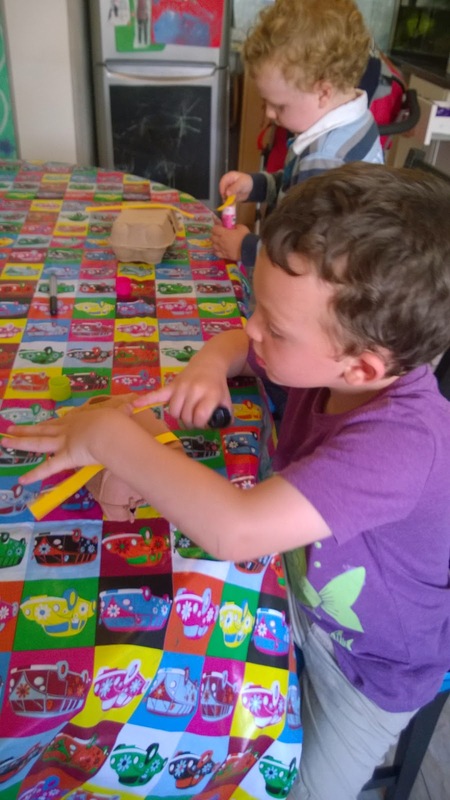 With Pirate Day coming up soon in Hastings our minds have been on Pirate themed activities this week. I noticed that Tesco's have started selling craft kits to turn items saved from the recycling box into toys so I decided to do what I do when I see ready meals - pinch the idea but make it from scratch myself. The kits do look cool and would make nice gifts - perhaps something to do at a grandparent's house if they have long ago cleared away all the paint and glue from when they raised you - but since we're regular junk modellers we have stacks of crafty bits put by already. 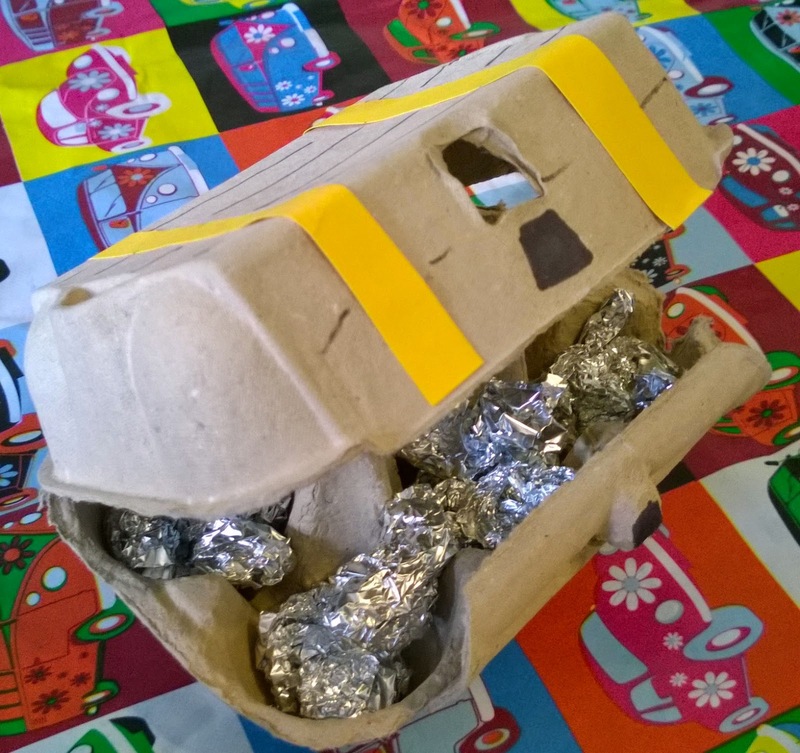 Today we decided to make egg box treasure chests. All we used were two cardboard egg boxes - ours were already brown so we didn't need to paint them (If all you have are plastic ones, then you can either mix poster paint half and half with PVA (white) glue to make it stick to the plastic, or use brown tissue paper with a half and half water and PVA glue mix to make paper mache to cover the box). with a black felt tip pen to make it look like a lock and drew lines on the lid to show the wooden planks the chest would be made from. 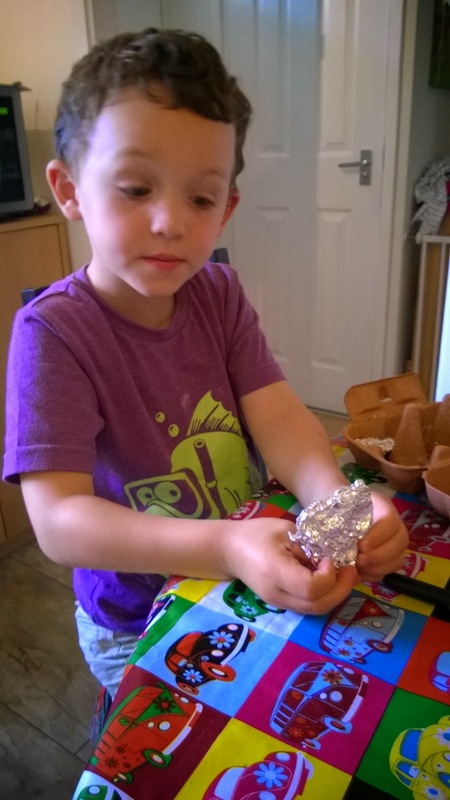 The final stage was to make some treasure - you can be really imaginative here with making bead necklaces, foil rings, plastic gem stones etc... We went with the simpler option of scrunching aluminium foil into coin shapes. 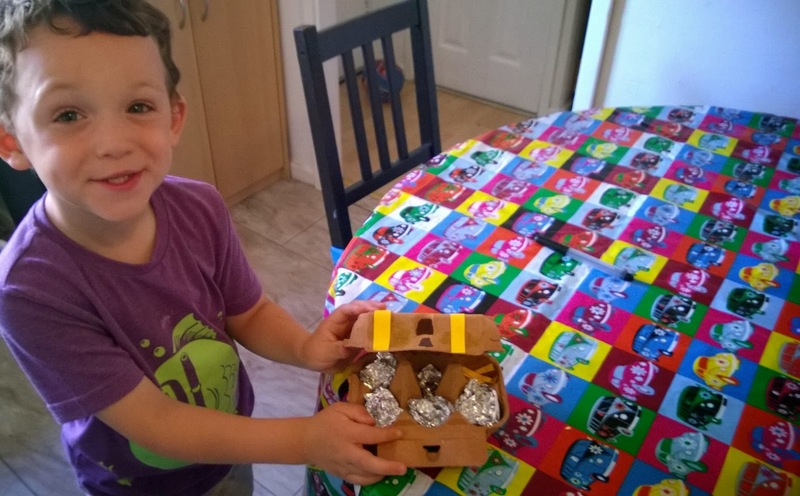 Toby has also coloured his on the inside with wax crayons, then used the treasure chest to store the crayons, the aluminium 'coins' and a Thomas the Tank Engine train. If you're looking for a super quick 10 minute filler activity that takes almost no time to set up or pack away and doesn't cause a lot of mess, this is ideal. It's not the most impressively realistic treasure box you will ever see, but the kids don't seem to care about that and have been 'burying' their treasure in the sofa cushions and under the raspberry bushes in the garden all afternoon.